C/2012 S1, Comet ISON, began in the Oort cloud, almost a light year away and has traveled for over a million years. On Thanksgiving Day, Nov. 28, 2013, Comet ISON will sling shot around the sun - but what happens next is a mystery. Either it will break up due to the intense heat and gravity of the sun or it will speed back away, destination unknown, but certainly never to return. C/2012 S1 was first spotted in September 2012, 585 million miles away. Scientists were instantly intrigued because, since this is ISON's very first trip into the inner solar system, it is still made of pristine matter from the earliest days of the solar system's formation. Its top layers haven't been lost by a trip near the sun. To mark the journey, NASA has assembled a vast fleet of spacecraft and Earth-based telescopes to learn more about this time capsule from when the solar system first formed. 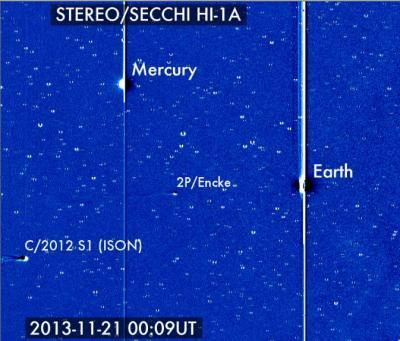 During the last week of its inbound trip, ISON will enter the fields of view of several NASA Heliophysics observatories. Comet ISON will be viewed first by the broad field of view seen by NASA's Heliospheric Imager instrument aboard its Solar Terrestrial Relations Observatory, or STEREO, Next the comet will be seen in what's called coronagraphs, images that block the brighter view of the sun itself in order to focus on the solar atmosphere, the corona. Such images will come both from STEREO and the joint European Space Agency/NASA Solar and Heliospheric Observatory, or SOHO. Then, NASA's Solar Dynamics Observatory, or SDO, will view the comet for a few hours during its closest approach to the sun, known as perihelion. The X-Ray Telescope on the JAXA/NASA Hinode mission will also be looking at Comet ISON for about 55 minutes during perihelion. All of these observatories will have different views. STEREO-B will be the only one that sees the comet transit across the face of the sun. In SDO's view, the comet will appear to travel above the sun, and the SDO instruments will point away from the center of the sun to get a better view for three hours on Nov. 28. In addition to learning more about the comet itself, these observations can make use of the comet as a tracer to show movement in the solar wind and solar atmosphere.